Each layer excavated is photographed and mapped. The Block 8 Latrine is a perfect example of how a new archaeological site is begun. After the latrine was located through soil samples, the site was staked out within an existing grid system and we continued to investigate. Members of the excavation teams worked to clear away the foliage, branches and tree roots with scissors, root cutters and trowels. 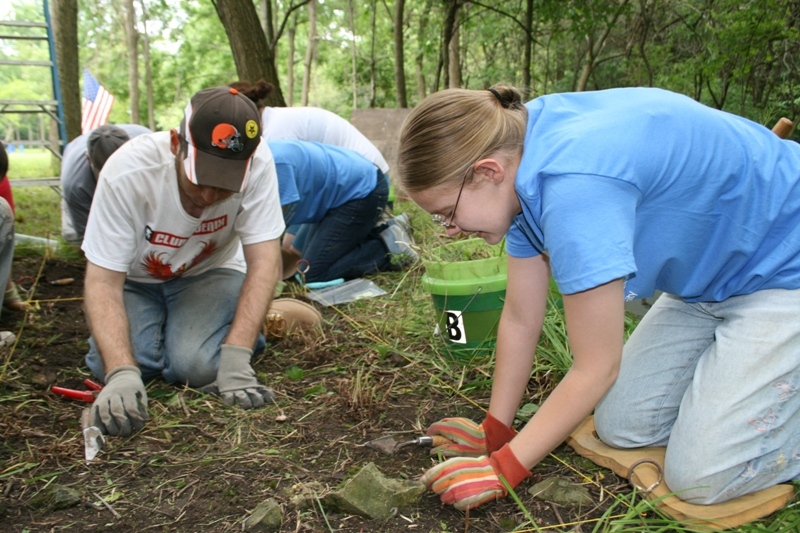 Once all the vegetation was cleared away, each team began to excavate their unit to a level determined by Dr. Bush’s excavation of a portion of the area. The purpose was to remove the disturbed topsoil above the undisturbed latrine. Excavating the Block 8 latrine. The excavation and screening of the top layers of the plow zone was completed quickly. Only a minimal amount of artifacts were found. .We continued to work deeper, carefully measuring our depth using the robo laser. As we neared the pre-determined level, excavation slowed as we took greater care to avoid harming any artifacts. 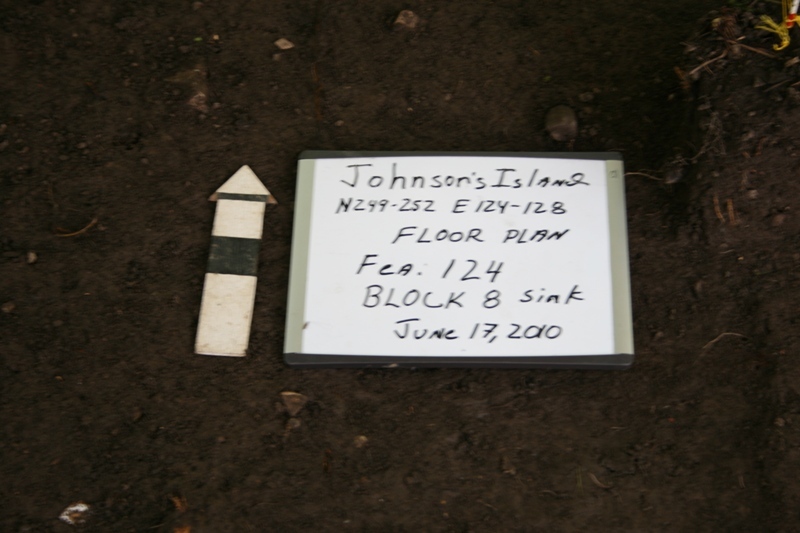 When the outlines of the feature began to appear, Dr. Bush decided to extend the two western units by one meter so that more of the latrine would be exposed for excavation. Once the latrine feature was exposed and the differences in the soil became more apparent, the feature was marked with colored pins. 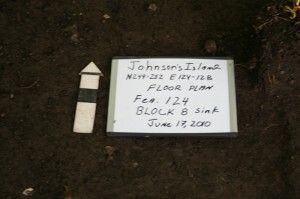 Dr. Bush photographed a floor plan of the feature, showing us the proper techniques. 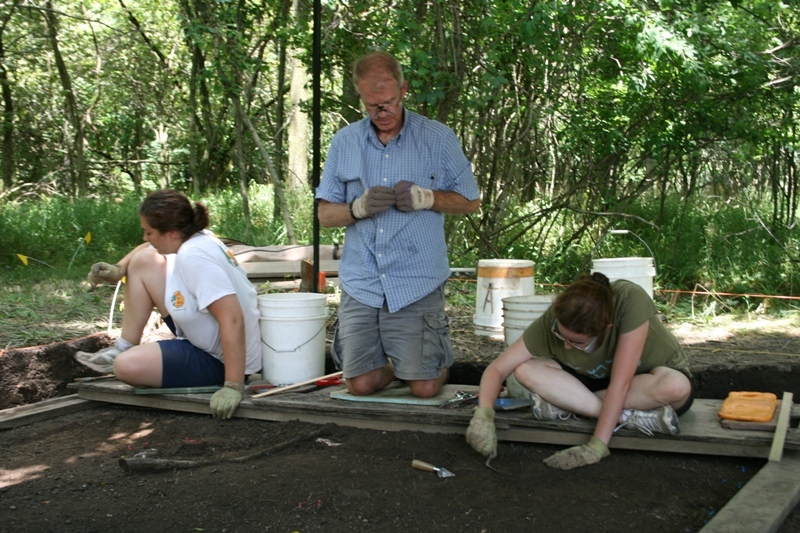 Dr. Bush overseeing the excavations of Feature 124, the Block 8 latrine. 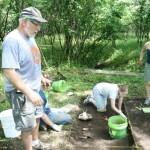 Following the photographing, each group has had the chance to excavate in the feature. It is a slow and careful process. While delicately excavating, smaller trowels and scoops are used. 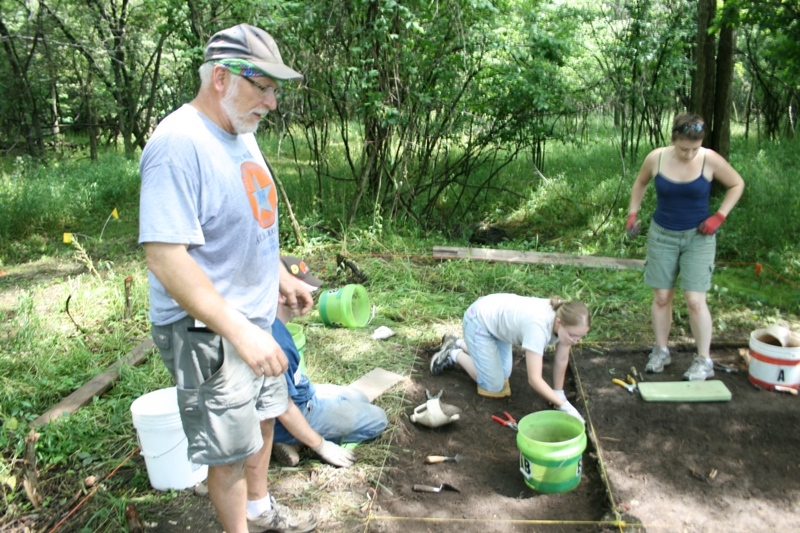 We carefully mark and leave in place any artifacts that appear as we excavate millimeter by millimeter. So far, a mirror shard, some bones, nails and burnt lime were found, which is very promising since we are only in level one. The latrine may extend down about five levels before reaching bedrock. We look forward to uncovering new and interesting artifacts as we continue deeper into the latrine. Keep watching for updates on the most recent finds. This entry was posted on Thursday, June 24, 2010 at 7:58 pm	and is filed under Field Reports. You can follow any responses to this entry through the RSS 2.0 feed. Both comments and pings are currently closed.